Although the Del McCoury Band has sprinkled its albums with songs by Tom Petty, Richard Thompson, and John Sebastian, it always has managed to infuse its music with healthy dose of tradition. Because of its dichotomous approach, it has been able to assemble a wide-ranging audience that spans generations, from fans of Bill Monroe to followers of String Cheese Incident. Nevertheless, its latest effort The Company We Keep is, at first glance, strikingly more conservative than most of the ensemble’s recent output. In fact, the collection’s 14 songs, which are connected by the common ground of family and friendship, are more autobiographical and personal than anything the group previously has issued, and the arrangements of the material are steeped in bluegrass-hued customs. 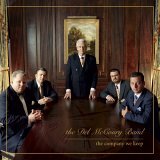 Beneath the surface of The Company We Keep, however, the Del McCoury Band’s progressive tendencies still manage to shine. As the musicians intertwine, with impeccable precision, their sterling streams of splendorous sounds, it becomes clear that there’s more to the outing than initially meets the eye. Indeed, the drama, the tension, and the drive that lurk within the group’s swirling instrumental interplay draw from the best that rock’s long-lived synthesis has to offer, and the vocals of the ensemble’s namesake have never been more passionately heartfelt and soulful. The recent departure of bass player Mike Bub certainly will alter the Del McCoury Band’s remarkable chemistry, but throughout The Company We Keep there are no signs that the collective’s foundation had begun to crack. Whether grooving through the shifting time signatures of Nothin’ Special; settling into the breezy bucolic bliss of Never Grow Up Boy; singing spiritual praises on I Never Knew Life; or defiantly delivering the lacerating lovesick blues of She Can’t Burn Me Now, there’s little doubt that The Company We Keep ranks among the Del McCoury Band’s best works.